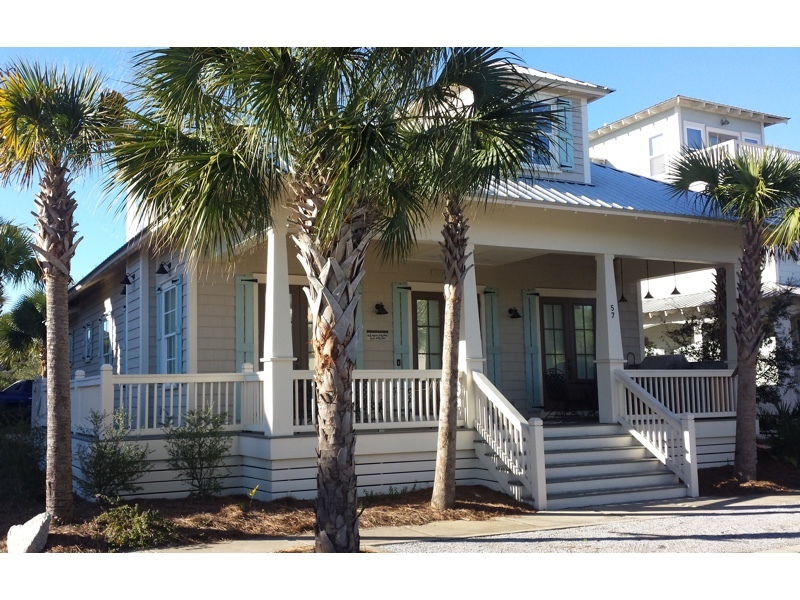 The Front Porch is one of the newer homes in the beautiful Seacrest Beach community nestled between Rosemary Beach and Alys Beach. Built in September 2013, it is a craftsman style Southern-Living floor plan with 2400 square feet. The main Kitchen/dining/living area opens up to the inviting 10-foot deep front porch with 3 sets of French doors. It is awaiting your next family get away! Our home is comfortable for 1 or 2 families – having 4 bedrooms and a large living room/dining room/kitchen area with space for everyone to gather. It sleeps 10-12. It is 2 blocks from the 12,000 square-foot pool area and the beach is an easy 5 minute walk, or you can call or flag down the free tram to pick you up at the front door. The gourmet kitchen has a gas stove, stainless steel appliances and beautiful granite countertops. It is fully stocked with all of your cooking needs including a Keurig coffee maker as well as a drip coffee maker, blender, toaster, crockpot, pots, pans and the ever important garlic press! The kitchen is open to the dining and living area creating a large room that is comfortable for everyone to gather. Just off the kitchen is the large 10 foot deep “Front Porch” with a separate outdoor kitchen having a Weber gas grill, sink and mini-fridge to keep your refreshments cold. It is convenient to all of the essentials in the main kitchen. There is table seating and a conversation set on the front porch as well. Sit and enjoy coffee in the morning and a cocktail in the afternoon while awaiting your steaks to be done! There is a fireplace in the main living area for those coming down in the Fall and Winter and a 46-inch flat screen TV above it. In addition to the main living area and 3 bedrooms, the main floor has a half bath and a laundry room. The 2nd floor is a large bunk room with 2 matching bunks, each having a full-sized and twin-sized bed as well as a pull-out sofa bed. Altogether the bunk room can sleep 5-7. There is a 46” flat screen TV with a DVD player and a private bath/shower. We have shelves full of books, games, DVDs, and beach toys for your use. It is a great place for the kids to hang out and play games, giving the adults quiet-time for an afternoon respite on the main floor. Each bedroom as well as the family room has a flat screen tv, and full cable and internet access. Outside, there is also a handy enclosed outdoor shower with hot and cold water to wash off the sand from the beach. And there is parking for 4 cars. Rentals can be booked direct through the owner at seacrestfrontporch@gmail.com.